Admission Buttons are available for $15 per person(ages 3 and under are free). They can be purchased at Rutherfurd Hall or online, but you must pick up the actual buttons at Rutherfurd Hall. There is limited onsite Parking at Rutherfurd Hall for the fee of $25 per car. The Pass can be purchased online but must be picked up prior. FREE shuttle buses will be available from Allamuchy Township School parking lot on Johnsonburg Road and at Panther Valley Ecumenical Church Parking lot located on Route 517. 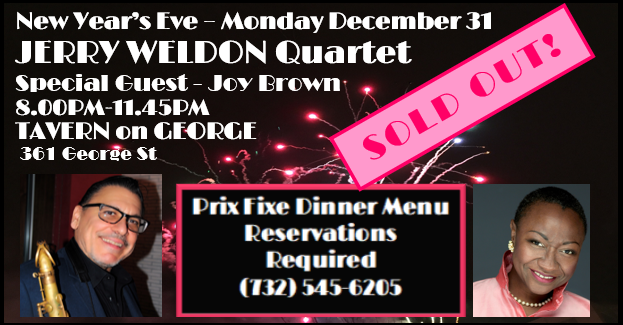 Carrie Jackson Jazz, Swing & Dance Party! 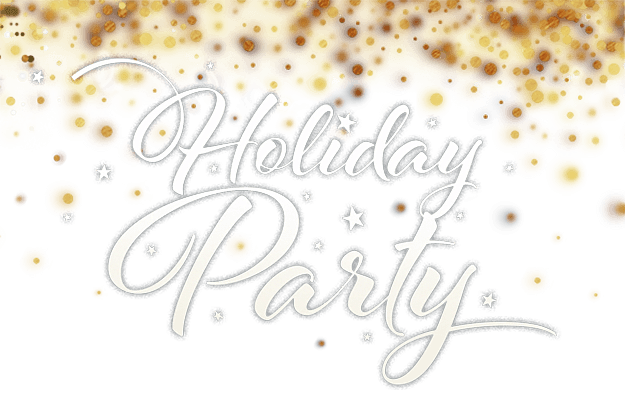 "So Bring your Dancin' Shoes"
Join us as we take a break from winter at our annual fundraising party to support the non-profit mission of Dreamcatcher Repertory Theatre. The celebration begins at the Elks Lodge, 40 Maple Street, in Summit at 6 pm with drinks and hors d'oeuvres. Enjoy unlimited beer, wine and soft drinks followed by a delicious dinner. At 8 pm the Dreamcatcher ensemble will bring you the History of the Theatre: ABRIDGED, because who has the time for all those details? This highly selective and patently unscholarly survey will take you from the Greeks through the present day, with all the boring stuff left out. Dessert and coffee will follow the performance. 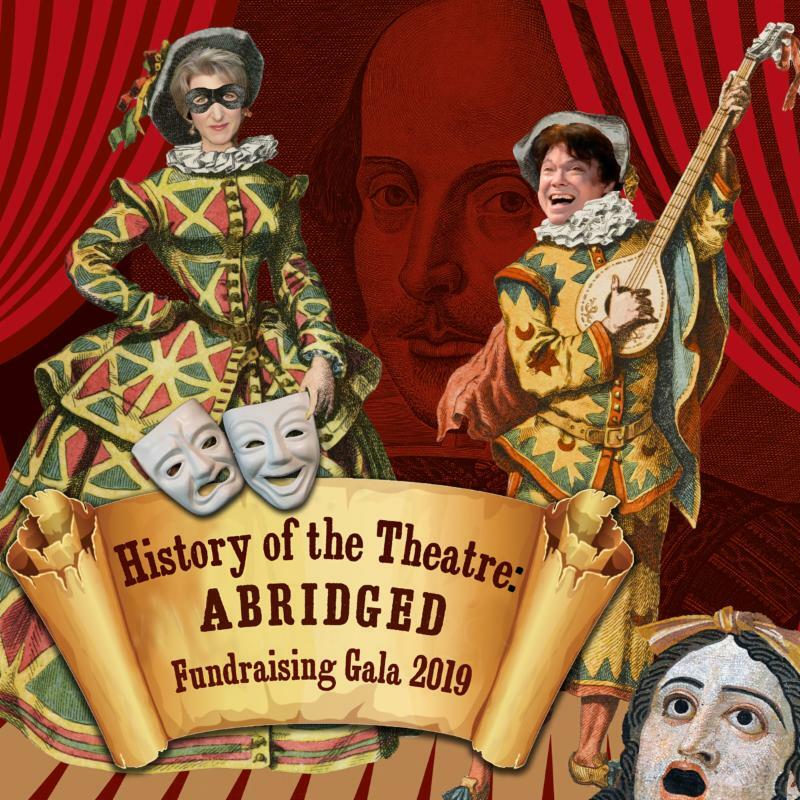 On the night of the party we will offer a silent auction and a 50/50 raffle, so you can take home goodies and support the theatre at the same time! Your donation, in lieu of auctions and raffles at the event, can be made while purchasing your ticket, or live at the event. 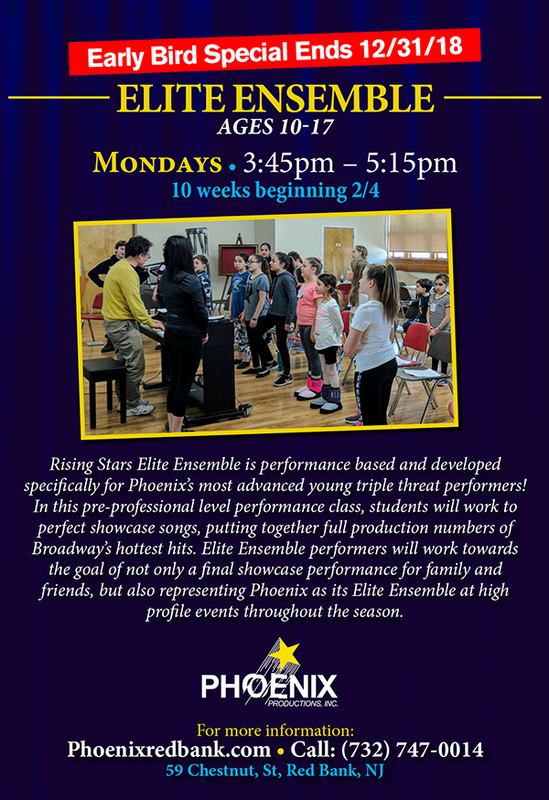 WHEN: Auditions will be held by appointment on Thursday, January 10 from 10:30 am – 7:30pm. To schedule an appointment interested performers must call the Centenary Stage Company box office at (908) 979 – 0900. Walk-ins will be seen as time permits. WHERE: Lackland Performing Arts Center at 715 Grand Ave. Hackettstown, NJ on the campus of Centenary University. Interested performers may prepare a monologue appropriate to the material or read from sides. Sides will be provided. 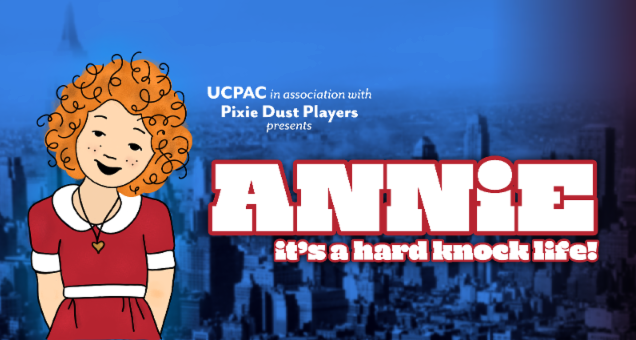 Rehearsals begin January 29 and run through February 15 with performances beginning February 15 through March 3. 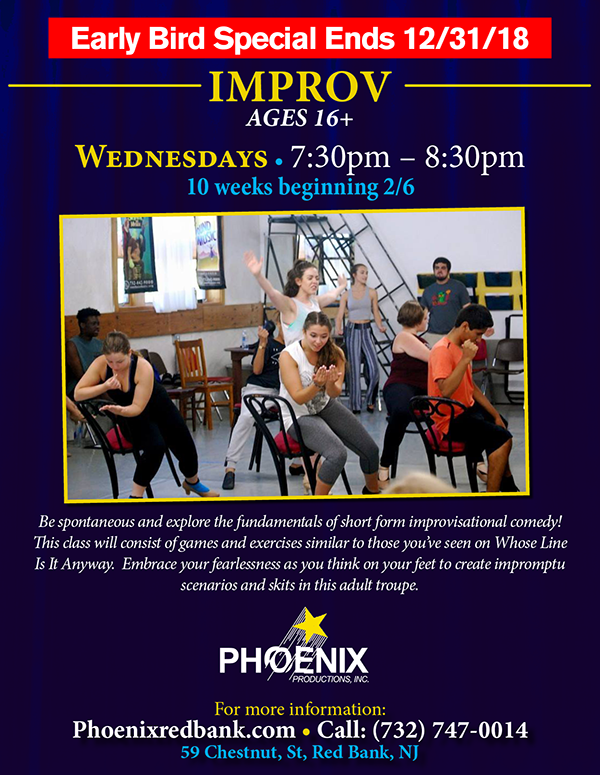 Performance days are Wednesdays and Sundays at 2PM, Thursdays at 7:30PM and Fridays and Saturdays at 8PM. Centenary Stage Company is a not-for-profit professional theatre company in residency at Centenary University and operates under an SPT 4 contract. An Enemy of the People follows Tom Stockmann, a geologist who discovers dangerous water pollution in the Springs, a highly anticipated resort that recently opened in his Norwegian town. In Tom's mind, the path to a solution is clear: inform the public and close the resort to prevent a crisis. With ripped-from-the-headlines relevance, this high-intensity drama is a powerful investigation of ambition, integrity and the price we pay for the truth. This full scale production is the culmination of the Gates Ferry Series: "What is truth?" Petra: Their daughter, a teacher. Peter Stockmann: Elder brother of the Doctor, Mayor and Prefect of police, Chairman of the Board of Directors of the baths, etc. Morton Kill: Master Tanner, Mrs. Stockmanns foster–father. Billing: On the staff of the paper. 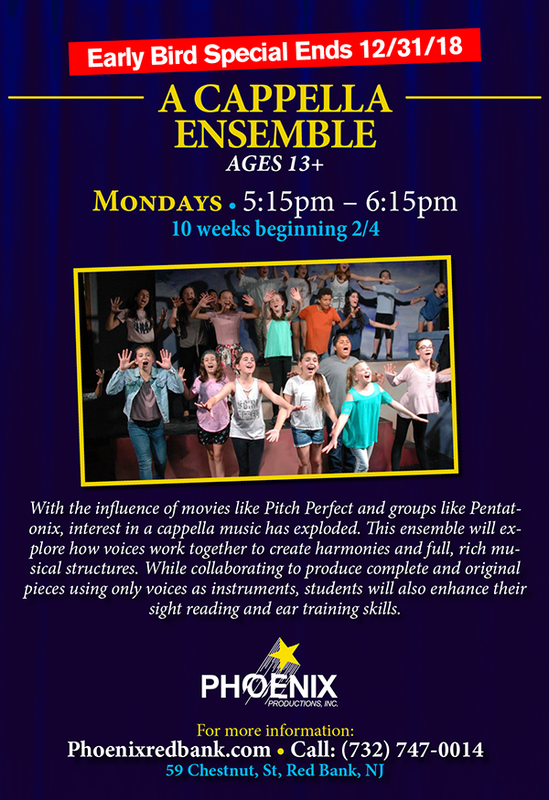 Ensemble: Looking for ensemble members who will be used for townspeople present at the town meeting; all sorts and conditions of men and women. The roles of Doctor Thomas Stockmann and Mrs. Stockmann are CAST. For more information, to download sides or the full text visit centenarystageco.org. To schedule an appointment call the Centenary Stage Company box office at (908) 979 – 0900. The box office is located in the Lackland Performing Arts Centenary at 715 Grand Ave. Hackettstown NJ on the campus of Centenary University. The box office is open Monday through Friday from 1 – 5PM and two hours prior to every event. Centenary Stage Company can also be found across social media platforms; Facebook, Instagram and Twitter. Like and follow to receive the latest in CSC news and offers. DEADLINE: Up to 3 JPGs of submissions should be sent to Hugh Mahon, hughman2000@hotmail.com by January 3rd. The Arts Council of Livingston Gallery invites all artists to submit works for its upcoming show, Black & White PLUS. All media will be considered including paintings, sculpture, photography, jewelry, pottery, glassware and textiles including wearable art. WHERE: Artwork will be received at the ACL Gallery, 2130 Carillon Circle, Livingston, on Monday, January 7th from 9:30 to 11:30 a.m.
Black & White PLUS runs Thursdays through Saturdays from January 12, 2019 to March 2, 2019. Artists and the general public are invited to attend the reception on Sunday, January 13th from 4-6 p.m. at the Gallery. 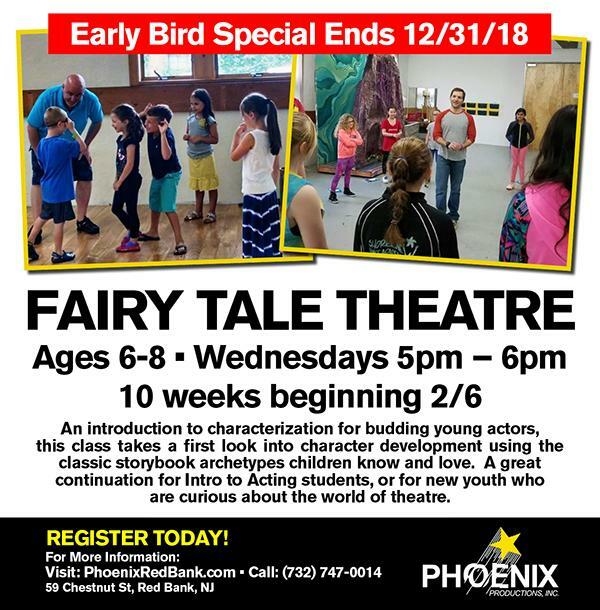 For further information please contact Hugh Mahon at 973-747-2257 or Vivian Olshen at 973-650-6347. Auditions will consist of reading from the script. Sides will be provided. Rehearsals begin immediately, three times per week; starting March 3, every evening. 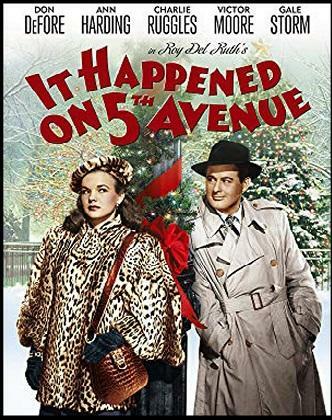 Pitting government against the press, well-being against economics, and family member against family member, this classic drama focuses on a doctor who has discovered a potentially dangerous health situation in his town and must now risk everything to do what he thinks is right. It raises and examines from all angles the question of what it takes to stand firm in one’s beliefs despite the objections of others. Dr. Thomas Stockmann (middle-aged): A medical doctor and chief medical officer of the town baths, also the brother of the mayor, who got him the job. Idealistic and excitable. From meager beginnings, he is now fairly prosperous and enjoys his life and status in the bustling tourist town. Mrs. Katherine Stockmann (middle-aged): Stockmann's wife, loyal and practical, family-focused, a source of grounding for her husband. Adoptive daughter of Morten Kiil. Petra Stockmann: Daughter of Thomas and Katherine, idealistic as her father, a hard-working teacher frustrated by laws requiring her to teach things she doesn't believe in. Peter Stockmann: Dr. Stockmann's brother, also chairman of the baths committee, a cautious but sometimes ruthless politician. Hovstad: Editor of the town's leftist newspaper, slightly corrupt, at heart a political radical. Aslaksen: The newspaper's printer with a degree of editorial control, chairman of the homeowners association, which represents the majority of voters, a lover of moderation. Billing: An assistant at the newspaper, radical but ambitious, with political aspirations. He is fond of Petra. Captain Horster: A seaman drawn into the political fray by his association with Stockmann. Morten Kiil: Owner of the tanneries implicated in the health hazard, adoptive father of Mrs. Stockmann, who stands to inherit his wealth. Questions? Contact us at TheMaplewoodStrollers@gmail.com. TICKETS: free with a suggested donation of $10.00 (or what you can). Donations can be made at the door or through the Writers Theatre website at www.wtnj.org. Writers Theater of New Jersey also offers a 7-Play Pass for a donation of $25; 14-Play Pass for a donation of $35 and a Big Read Pass for unlimited readings for a donation of $50 which includes guaranteed entry to all reading events including: Soundings Series, New Plays New Jersey, New Jersey Women Playwrights Reading, and Mile Square Playground. The dates and locations of these other reading series can be found on the WTNJ website. The Writer’s Theatre of New Jersey is kicking off their 2019 season with a series of new play readings in the new Madison Community Arts Center venue. This Winter Madison will be filled with writers eager to hear their pages come to life in front of an audience. There will be 15 plays in 15 days. Soundings Reading Series is designed to test a fairly developed play in front of an audience. 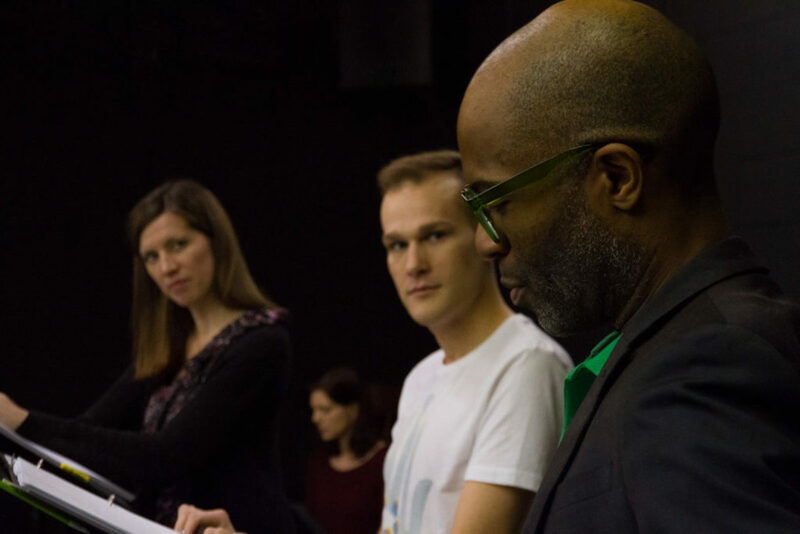 The playwrights receive five hours of rehearsal with professional actors and a director, before their pieces are presented to the public. All readings are followed by a discussion with the author and director, guided by Artistic Director John Pietrowski. For more information on the individual plays and playwrights and for tickets, please visit the theatre’s Soundings page. 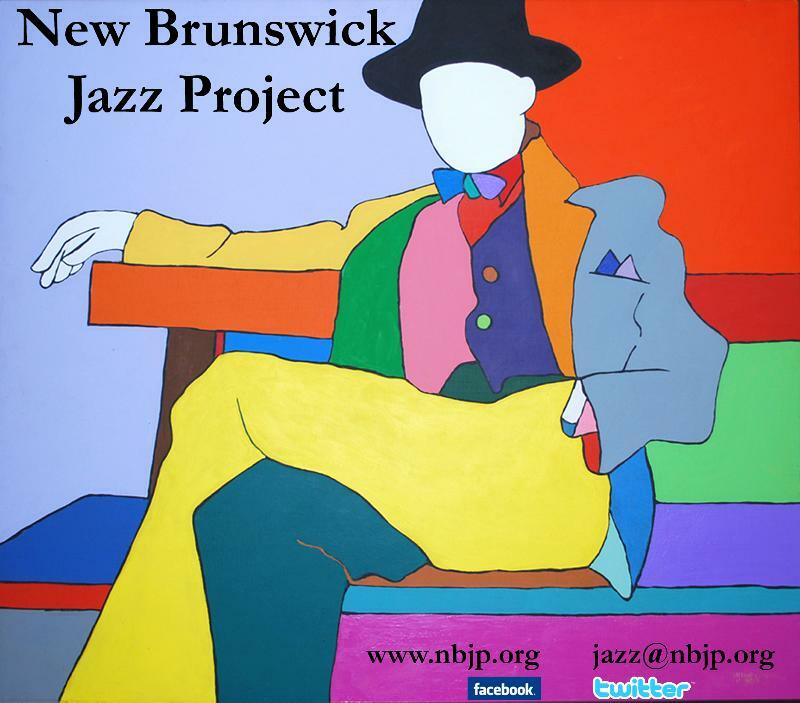 Funding for our activities comes from: the New Jersey State Council on the Arts/Department of State, a Partner Agency of the National Endowment for the Arts, the Geraldine R. Dodge Foundation, the F.M. Kirby Foundation, Inc., The Victoria Foundation, and many corporations, foundations and individuals. 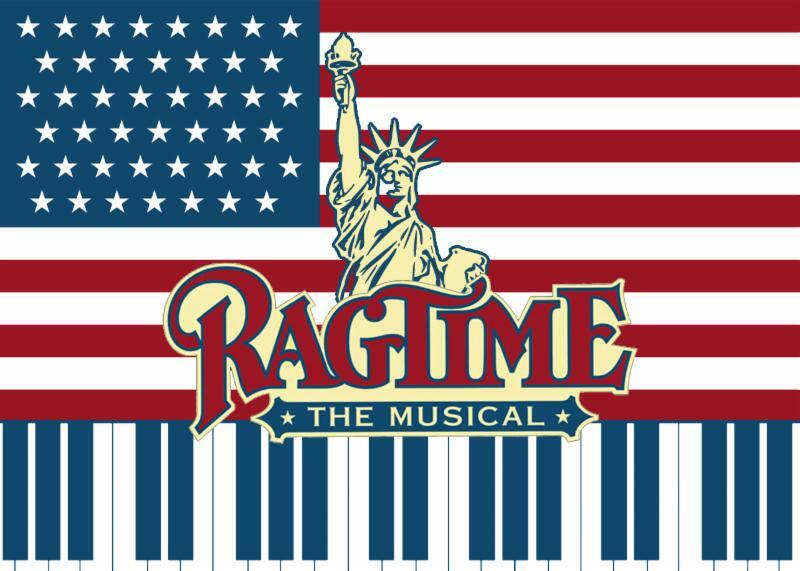 Rehearsals will be held Friday-Monday beginning in late March. Performers will only be called when their role is being rehearsed (actors will not be called every day within this time frame). 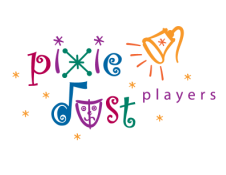 NOTE: If you are unavailable to attend auditions in person, you are welcome to submit a video audition to info@pixiedustplayers.org (including a link to a video of your performance and your completed audition form) by Tuesday, January 1 at 8:00pm. Auditions will be held in January and will be open to ALL AGES! Make sure to follow us on social media for updates! 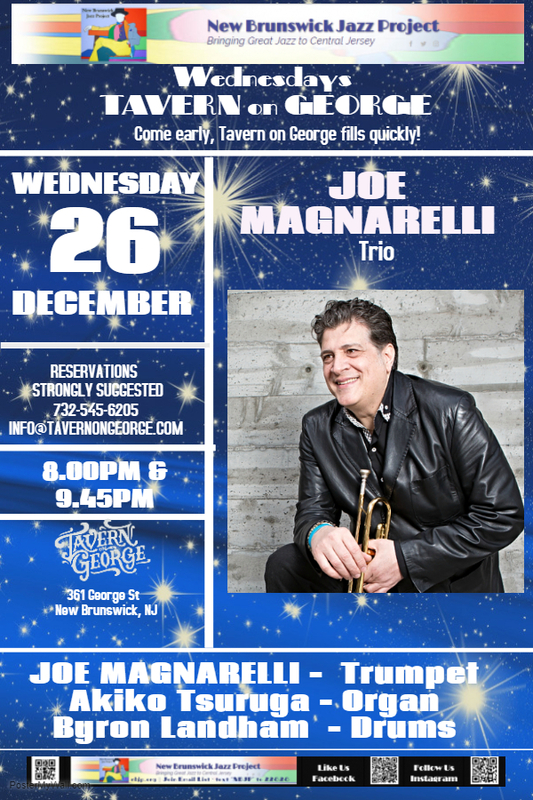 Syracuse native Joe Magnarelli moved to New York City in 1986 and soon became a regular on the NY and international jazz scene. Joe currently has nine records out as a leader, and has played on numerous jazz labels as a sideman. 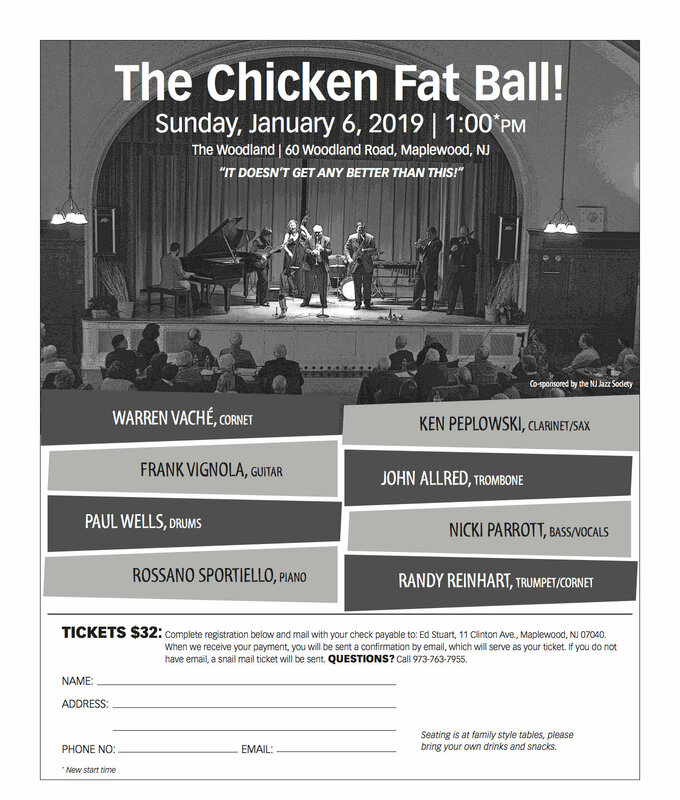 Magnarelli has worked and toured with the Vanguard Orchestra, Jane Monheit, Jon Hendricks, Jimmy Cobb, Louis Hayes, Alvin Queen, Dado Maroni, Marty Sheller, Tom Harrell Big Band, George Gruntz, Harry Whitaker, Walt Weiskopf, Grant Stewart, Charles Davis, Nick Brignola, JR Monterose, Gary Smulyan, The Carnegie Hall Orchestra, Don Sebesky, John Pizzarelli, Aretha Franklin, and the Lincoln Center Orchestra. Vanessa Perea is a jazz vocalist who embodies the tradition of the masters. Having been influenced by many different styles of music, she has a sound all her own. She began her musical journey at the age of 10 when she started taking piano lessons with her church organist and choir director. 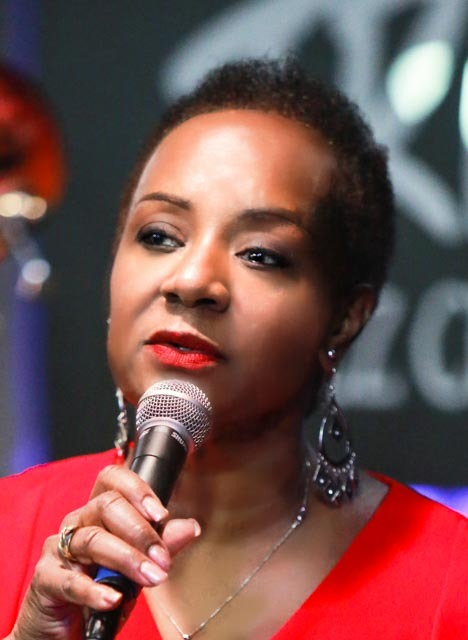 Vanessa attended New Jersey City University and subsequently began working as a jazz vocalist in the NY/NJ area. She is a member of The Ladybugs, where she sings and plays drums & percussion and with whom she recently traveled to China with for a three-week residency at Jazz at Lincoln Center. 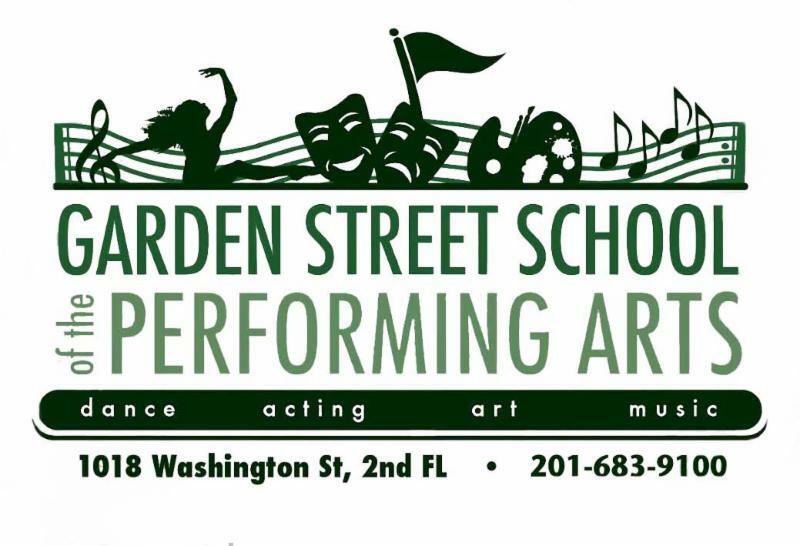 NOTE: THE WOMEN’S MARCH ON NEW JERSEY is not affiliated with the Women’s March, Inc.
January @ GARDEN STREET SCHOOL OF THE PERFORMING ARTS: Music Lessons, Dance Classes + More! Now you can try any dance class for only $10! New Flexible Dance Plan: 6 classes for $229! Monthly Membership: For $149 a month join a class, and learn that specific style for the rest of the school year. New 6 Week Mommy and Me Classes: $120 for 6 Mommy and Me Classes New Session Jan 7th. 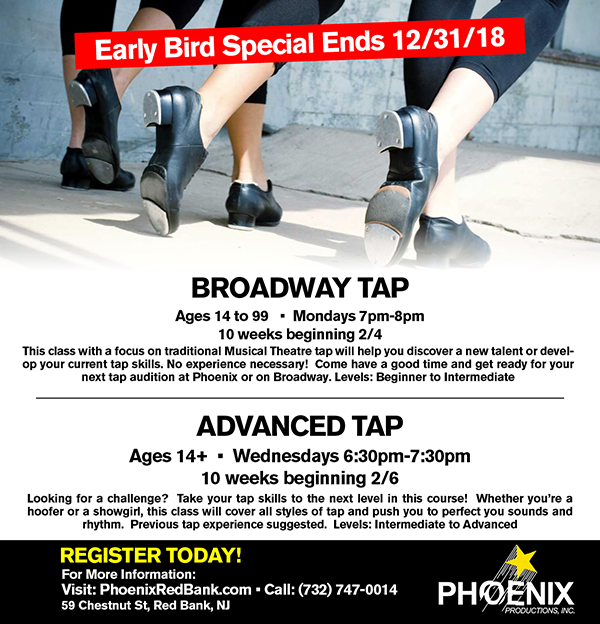 Dance Classes Open For Enrollment In January! We offer Piano, Guitar, Violin and Voice lessons. 1st Lesson Free! Private music lessons. Monday-Saturday classes available. We fit your schedule and match you with the perfect instructor. 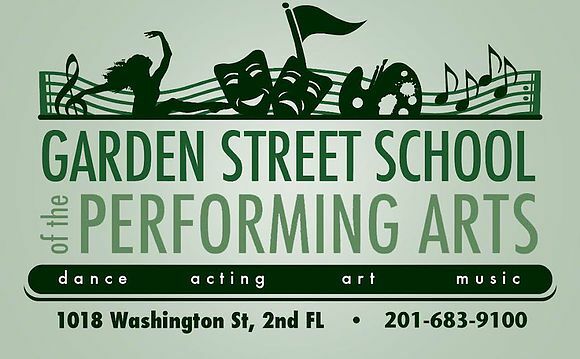 Email dance@gardenstreetmusic.com for more info on any of our programs, and to sign up! 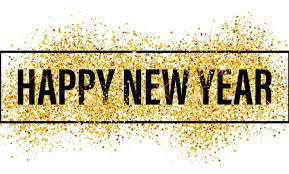 It's time for you to go out and celebrate New Years Eve while your children have the best time at their own party! Ages 4-12 are welcome to ring in the New Year with us. We will serve food, snacks, treats and more. We will have a dance party, live music, an art craft to take home, the televised ball drop event, movies, games and so much fun! You can have peace of mind that your kids will have a blast while you go out on the town. This is a much better option than spending a fortune on a babysitter and your kids will be so excited to go to their own party! Dan, Annie, Finn and Jack (owners and their children) will be the hosts of this event. Your children will be safe and having the time of their lives! Dance Class Party: An upbeat movement and music class with fun games and activities. Live Music Sing-A-Long: We will play piano and guitar and sing your kids favorite songs and they can sing along! Movie and Ball Drop: Shown on our professional 6 foot by 8 foot movie screen and projector for a mini movie theater experience! Both classes will be taught by director Jessica Damrow Sherman. In this class, Jessica touches on choosing classical monologues for auditions, and then delves into the hard work of both preparing them and delivering them in performance. Special focus will be given to voice and diction, physicality and maintaining an active objective throughout the speech. Students should come prepared with one or more classical monologues they wish to work on in a class setting. Attention will also be paid to overall audition technique. All classes must have a minimum of 4 people registered to be held. To register, interested parties should email jshermantheatricalcoaching@gmail.com. 5 MORE PERFORMANCES OF “THE NUTCRACKER” IN NEW BRUNSWICK THIS WEEKEND! The only ARB performances featuring a live orchestra and choir! 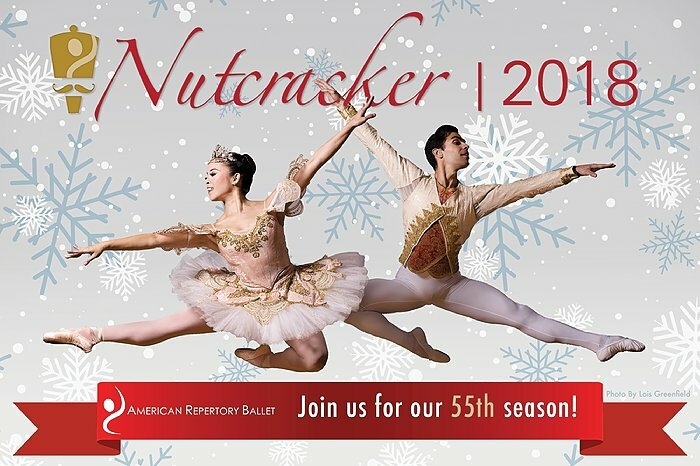 ARB’s Nutcracker is the perfect holiday treat for your entire family! Children auditioning for the role of Little Boy/Edgar and Little Girl will be heard FIRST. They must arrive shortly before scheduled audition starting times in order to be heard. Please contact info@LONJ.org to register for one of the above dates. Include your head-shot, resume and home town. For further information about audition requirements and roles, click on the "Learn More" button below. 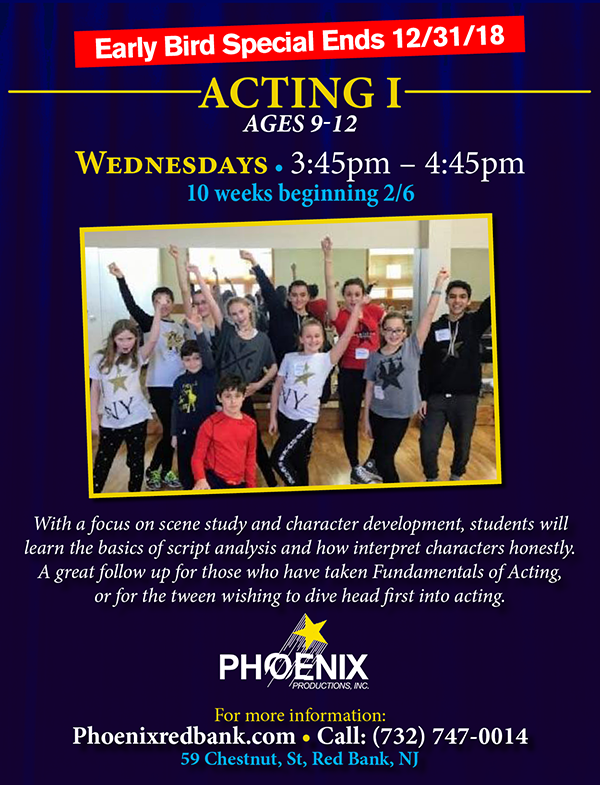 Phoenix Productions’ 2019 Gala Auditions Announced! We recreate your favorite Broadway musicals in full-scale revivals. The choirs at Grace Episcopal Church in Madison, under the direction of Dr. Anne Matlack, are preparing special choral services for Christmas. Featuring Pergolesi’s Magnificat with strings. The public is welcome to this free event, followed by a “Wassail” reception with mulled wine and cider, sausage rolls and mince pie. Costumed children present the Nativity Pageant while the 50-voice youth choirs lead the music in traditional carols from around the world. The Gargoyles (teen boys) and the select Daughters of Zion (teen girls) will also be featured. A children’s bell choir will ring in the prelude, and a handbell quartet serenades you as you leave. WHEN: 10 p.m. a candlelight concert of carols from around the world sung from the gallery precedes the traditional 10:30 Midnight Mass. A choir of adults, older children, and returning college students, and a bell choir lead the beautiful Rite I communion service featuring works by Howells, Rachmaninoff, Ramirez, Yon and many soloists. “Silent Night” sung kneeling by candlelight concludes the service. Christmas Morning at 10:30 a.m. is a service for all ages of carols and communion led by children and adults. Choir carols include “Once in Royal David’s City,” “O Come, Little Children” “I Saw Three Ships,” “Away in a Manger” and a rousing “Go Tell it on the Mountain” during communion. Sunday, December 3,0 at 10:30 a.m. the choirs present a traditional Nine Lessons and Carols service. Visiting singers are welcome to join the choir by attending rehearsal at 9:30 and calling the church, or responding on Grace Church’s Facebook page to let Dr. Anne know. The community is welcome at all of these services. More information can be found at www.gracemadison.org or on facebook at Grace Episcopal Church Madison or by calling 973-377-0106. Dr. Anne Matlack holds degrees from Yale and Cincinnati Conservatory and also conducts the award-winning Harmonium Choral Society, www.harmonium.org. Rooted firmly in traditional 19th and 20th century klezmer (the music of the Jews of Eastern Europe,) T-Klez plays a full gamut of tasty tunes. These range from spirited dance pieces which are often played at weddings and other festivities, to slower waltzes, tangos, and Romanian horas. In addition, their selections include spiritual wordless melodies of the Hasidism, as well as new repertoire from Romania and the United States. Based in Teaneck, New Jersey, the members of T-Klez are veterans of stage and community celebrations. 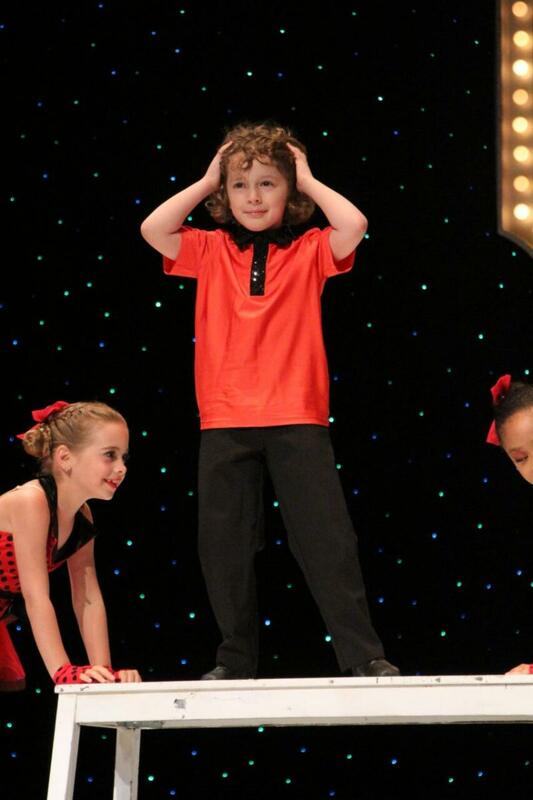 T-Klez’s performances are fun and educational and their dance sets can rock the house! TICKETS: One inexpensive admission (before 12/21: $20/ticket; $17.50 for 4 or more; prices go up 12/22-12/31/16) covers all events at First Night®. Every venue is indoors and a free shuttle will take you to nearly all locations. 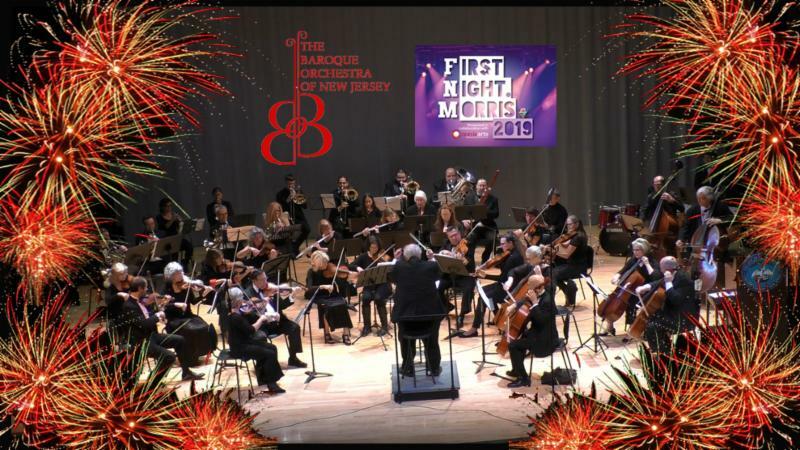 For more information, the latest program updates, to volunteer or to purchase tickets, please visit the First Night® Morris County website at www.firstnightmorris.com or call the First Night Morris official ticketing partner, the Mayo Performing Art Center Box Office at (973)539-8008. December 31, 2018 marks the 27th year of New Jersey’s biggest and brightest First Night, a New Year’s Eve family-friendly, alcohol-free celebration of the arts—with more than 100 artists, 81 events in 23 venues—representing dance, theatre, music, world cultures, visual arts and children’s programs. For all 27 years, Morris Arts has been First Night Morris’ artistic programmer, securing topflight talents who attract thousands from throughout the state and beyond. More than half of the program features new artists (or artists returning after several years), many of whom have performed at world class venues, won international recognition, performed on national radio/TV, in major films and/or collaborated with superstars of performing arts. 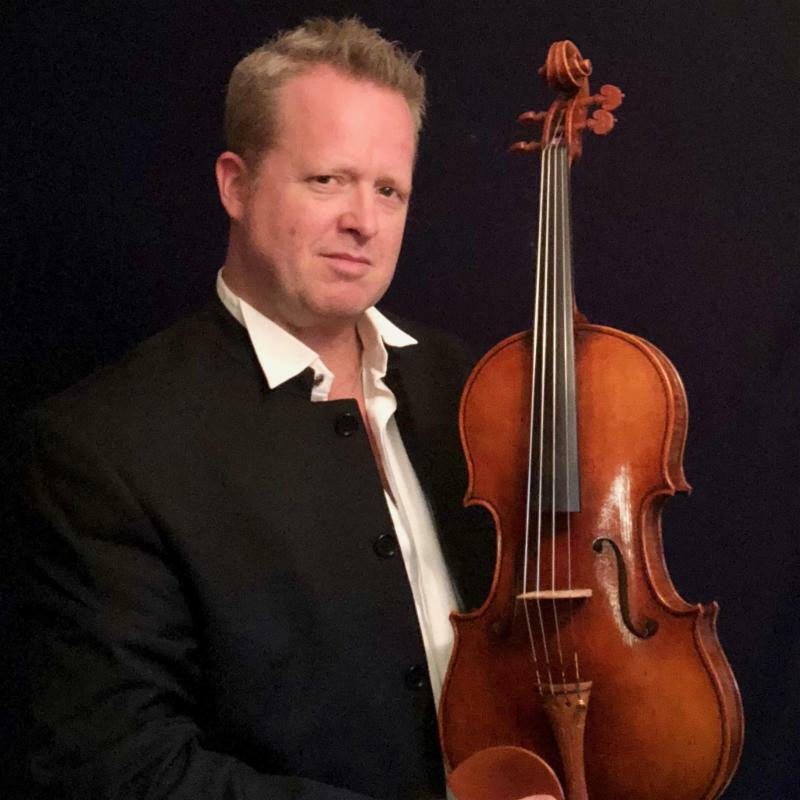 On that night, one can experience everything from a gypsy/neo-Balkan Trio, a Moldovan piano virtuoso, or a legendary hot jazz guitarist to a one-man sideshow, a champion Irish fiddler or a live reptile show. L-R: The legendary Frank Vignola and his Hot Jazz Guitar Trio; John Ginty with his Hammond B-3 organ; The Feinberg Brothers Bluegrass Band; The Zydeco Revelators; The Cobra Brothers Blues Band; Dana McCurdy’s Community in Rhythm Drum Circle; Rio Clemente, Bishop of Jazz. On the Rock/Bluegrass/Blues/ Zydeco/Drum front, The John Ginty Band rocks the house, showcasing Ginty, who toured/performed with the Dixie Chicks, Jewel, Santana and received two Grammy nominations as a founding member of Robert Randolph & the Family Band. The Feinberg Brothers’ 5piece band, profiled expansively in a recent Bluegrass Unlimited, embodies classical bluegrass with their tight, soulful harmonies and masterful, intricate instrumentals. For gutsy, full-throated blues, wailing harmonica riffs, and raw voiced vocals (with a touch of funk, R&B, country and jazz), catch the Cobra Brothers – heard at blues festivals, The Stone Pony and The Bitter End. Got rhythm? Connect with Dana McCurdy’s Community In Rhythm Drum Circle. Looking for flavors from New Orleans “Big Easy”? The Zydeco Revelators offer that sweet Cajun accordion, cool rubboard vest mixed with zydeco classics, rock and jam band in an irresistible “jambalaya” of sound. 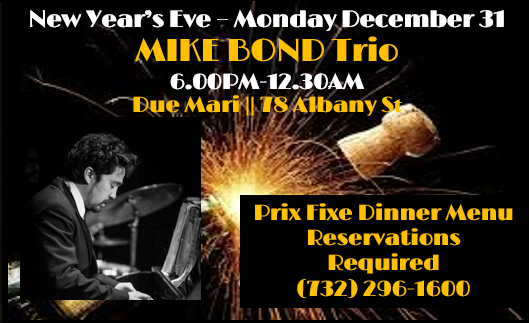 Hankering for Jazz? Miracles happen. After a near fatal accident, the legendary guitarist Frank Vignola is back and better than ever with his Hot Jazz Guitar Trio, with guitar partner, Vinny Raniolo, and “monster” bassist, Gary Mazzaroppi. One of the top five guitarists in the world according to the great Les Paul, Vignola has performed with Lionel Hampton, Ringo Starr, Wynton Marsalis and other superstars, bringing his astounding virtuosity, sly humor and incomparable musicianship back to our stage. First Night would not be complete without our own sizzling jazz pianist, Rio Clemente (the “Bishop of Jazz”) whose inventive and sparkling improvisations astonish and inspire all. If Folk Music is your bag, be sure to catch the wit and wordplay of comedy folk singer, Carla Ulbrich, with her songs about wedgies, Waffle Houses, Klingons and how rich she would be if she had the copyright on the “F” word. Remembering Pete Seeger, Spook Handy “keeps the flame alive,” in his ongoing World Tour, sharing Seeger’s music and legacy in all 50 states, 10 Canadian provinces and 21 NJ counties. You’ll want to hear the Windborne Singers, a unique quartet of vocal chameleons who will captivate you with the purity of their voices, their close harmony singing and a fascinating repertoire spanning centuries / cultures. First Night’s generous sampling of World Cultures includes the global fusion ensemble, Afrika meets India, blending the rich rhythmic and melodic traditions of India and Africa. Irish (and other) eyes will be smiling at the music of champion Irish Fiddler, Brian Conway while Tavche Gravche, a Gypsy/neo-Balkan trio, offers a unique, fiery mix of Balkan/Eastern European and Mediterranean melodies while maintaining the explosive dance rhythms of Balkan music. Feeling mellow? Groove on the lilting, joyous music of Random Test Reggae playing Caribbean reggae, soca and calypso. Alborada Spanish Dance Theatre showcases Spanish flamenco traditions while Shubanjali’s dancers highlight Indian Classical/Folk Dance. Looking for Theater/Comedy? Laugh your way into the New Year with the wit and wry humor of two comedy stars, Erin Jackson and Tom McTiernan. Erin’s megawatt smile and keen insights have made her a regular at NYC’s top comedy clubs, on numerous TV comedy shows and as a semifinalist with NBC’s Last Comic Standing. Tom is one of the East Coast’s best (and cleanest) comedians, featured at top clubs on both the East and West Coasts, on TV and opening for top acts in Atlantic City and Las Vegas. More laughs are in store with Mr. Hypno’s Comedy Hypnotism as hypnotized volunteers discover such hidden talents as ballet dancing or cow milking! Illusionist Benjamin Lipman’s Comedy Cascade combines circus arts, vaudeville and humor with juggling, mime and magic. Billing themselves as “Manhattan Transfer meets Second City,” The Loose Canons are master purveyors of musical parody. A semifinalist with America’s Got Talent, David Darwin, the one-man sideshow, astounds audiences with his contortions, sword swallowing, glass walking, magic, juggling, fire manipulations and comedy. And, if you love history, don’t miss Living Voices: Our Revolution, a profoundly moving account of the American Revolution, told from the perspective of an African-American soldier (portrayed by a professional actor) and enhanced by riveting documentary graphics. The early session for younger children (4:45-6:45pm) includes hula hooping with Whirled Revolution, art making activities with artist Samantha (“Sam”) Matthews’ Art 4 Kids and Fun with LEGOs®. 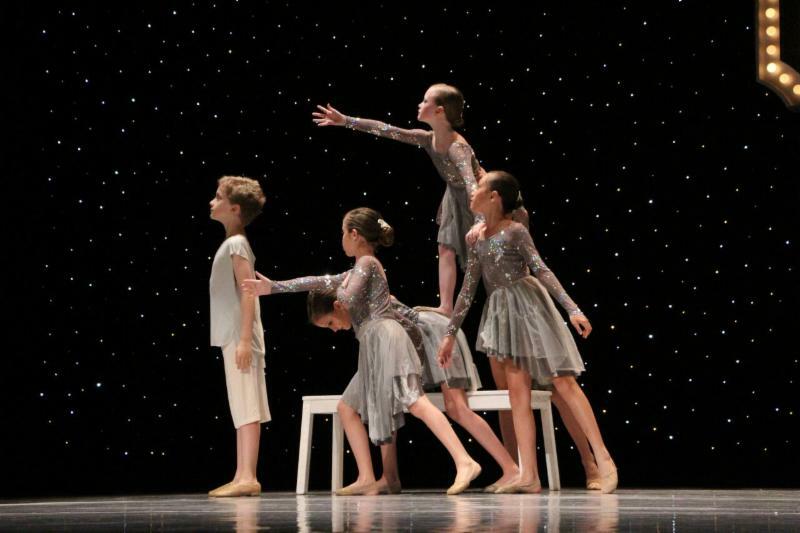 New to this year’s early session is the NJTAP2, an ensemble of young tap dancers, sharing their skills in rhythm tap dancing as well as Square Dancing with Caller, Mary Moody, with fun for the whole family. No experience is necessary to try Zentangle, a unique method of drawing using structured patterns, guided by art teacher Mimi Topping. 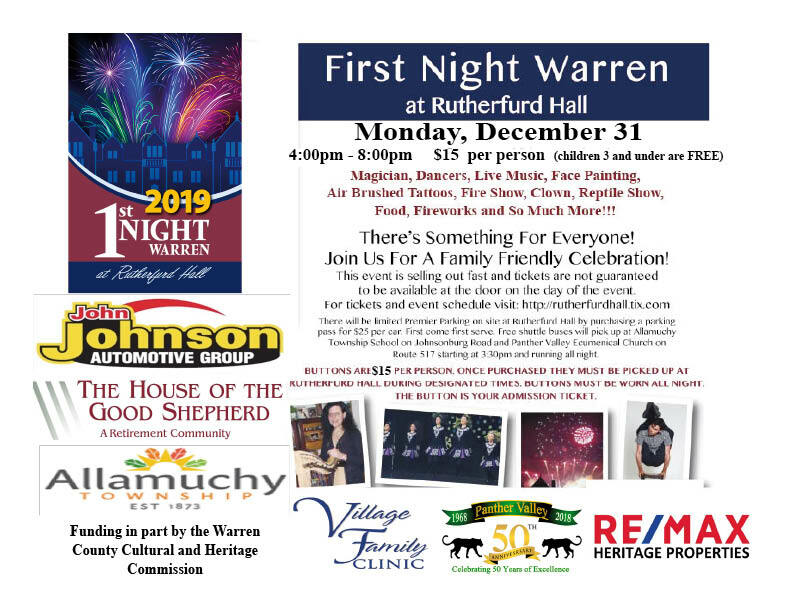 And, as in years past, three visual arts exhibits (displaying over 300 artworks) and two sets of fireworks top off that magical evening known as First Night® Morris County. To check out the full lineup of artists, visit: www.firstnightmorris.com.